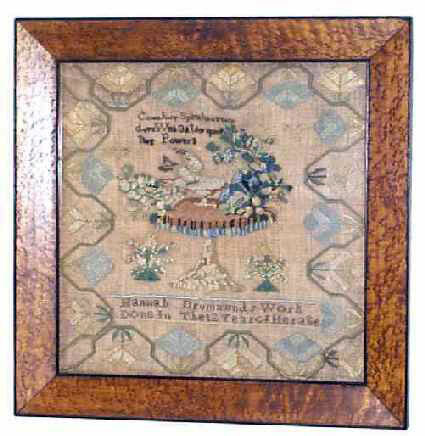 This unbelievable Pennsylvania schoolgirls sampler features a rare and outstanding pictorial composition. Its strong visual appeal is derived from the handsome overall design coupled with the outstanding skill with which it was executed. In an exuberant fervor, a bird dives into the bath while two delicate birds soar above. Beneath, two more baby birds sit quizzically atop delicate bushes. We find that 12 year old Hannah, under the tutelage of an obviously talented instructor, took this subject matter to a new level. This high-styled composition and extravagant visual format literally fills the frame and the senses. I must admit I have never seen another quite like it. Preliminary research shows that our samplermaker was Hannah Drummond, born in 1818 in Cumberland County, Pennsylvania. Her father was James Drummond. Flawlessly rendered, this important example is a must for the serious collector of American samplers. 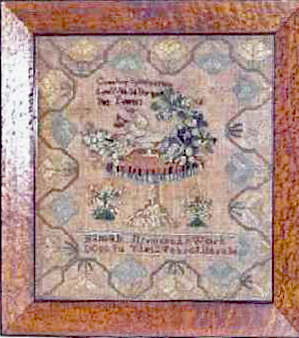 Worked in silk on linen, this sampler is in very fine condition and conservation mounted into a custom Birdseye Maple frame with an ebony bead and protected with Tru Vue Glass. 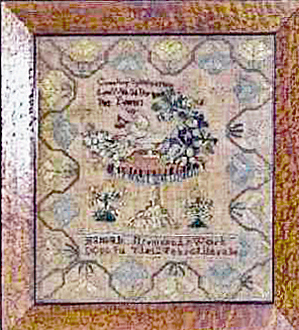 Sampler Size is 20" x 20"